This blog was written by Thomas Livengood. Meet our blogging fitness specialists at the NIFS website. 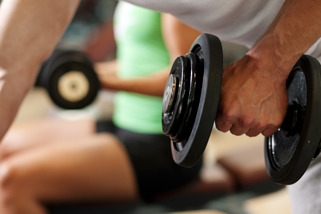 Rumor has it, you build muscle by lifting weights, doing cardio, and being physically active every day. Okay, that is important along with a balanced nutrition plan; but in reality, muscle is built during your recovery phase. For those who work out multiple times per day or work the same muscle groups day in and day out and see little or no growth, you may not be allowing your body ample time to rebuild itself. This is also known as overtraining, which can lead to such undesired effects as lack of physical progression, chronic fatigue, compounding injuries, and overall boredom. Keep in mind, most people do not overtrain. How can you get the most out of your recovery phase? Because you need calories and nutrients to exercise, first plan to consume something before a workout; the window can vary, but at least you have something in the tank. Next, make it a priority to eat sometime soon after you finish; your body is searching for ways to replenish and grow. Finally, rest up. Muscle is built not while you work out, but when you are recovering.